4 good reasons to enjoy it! The spatial design, not to neglect! In residential renovation, spatial design is not just about choosing materials and colors. It is a complex creative process that takes need to take in consideration the customer’s needs, the existing building, the work conditions, the style and effect, lighting, budget allocation and many other factors. 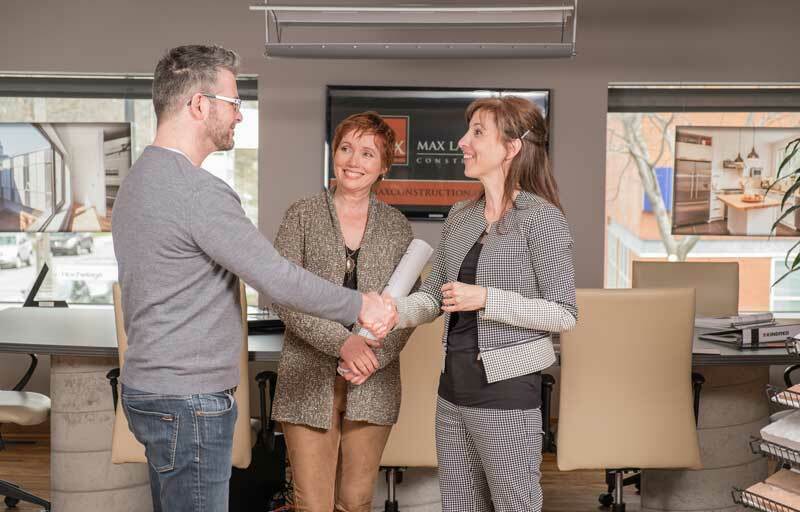 With our spatial design team, Construction Max Larocque assists you through all the stages of the renovation process. Making judicious choices of works and materials is key to make your home renovation a good investment, and not a worthless expense. It is a crucial step of spatial design. 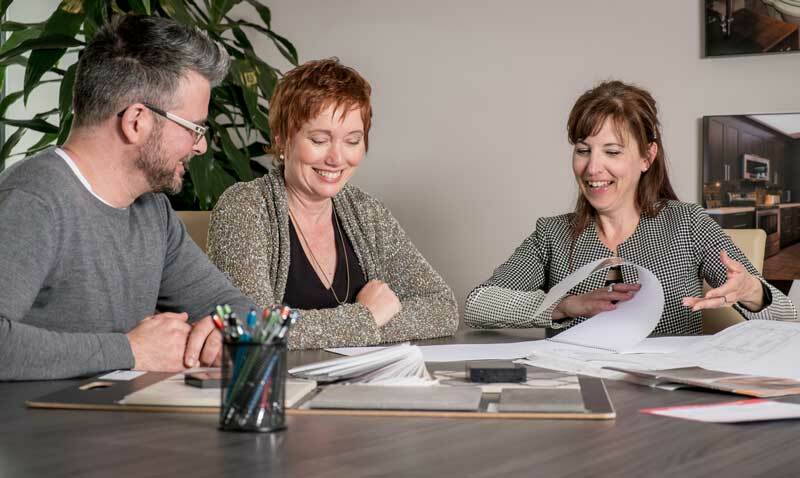 Our design consulting services teams know the materials and the current trends that will make your project an optimal choice for your needs and your budget. We often underestimate all the time spent in meetings and trips to various specialized shops to go around a complete project. Our showroom and design services presents all the materials and catalogs in one place for interior and exterior finishes, floor coverings, cabinets and countertops, roofs, doors and windows, sanitary, hardware, stairs etc. Everything to optimize the spatial design. It is then easy to harmonize shapes, colors, finishes and textures without losing infinite time in trips. All this without any extra fees. 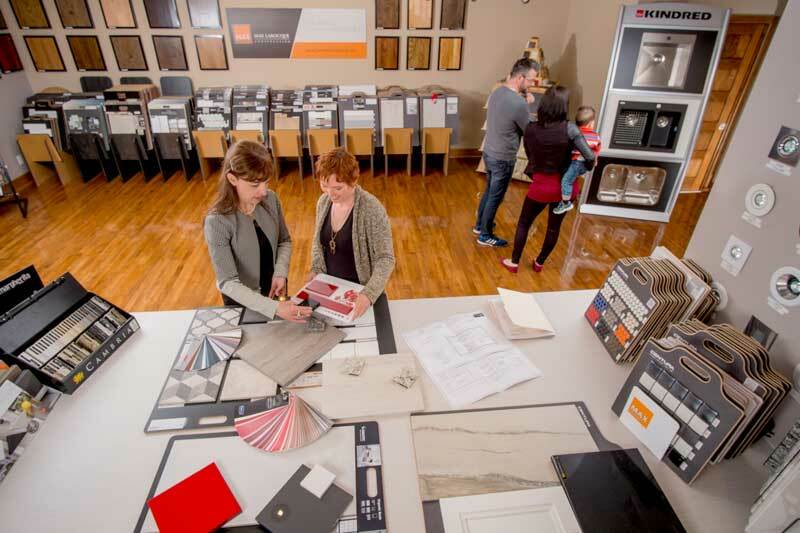 Our showroom, product samples and catalogs make it easy for you to examine products before they get installed in your home. The ability to see materials in real life allows you to make the right choices and to create an optimal spatial design. The plans and sketches of our designer then allow you to visualize them in the context of your project. Unlike other specialized showrooms, which present you only the few new trending products, we have, with all our accomplished projects, many examples of various styles that could better adapt to your home. A good coordination of the renovations works always starts with a good planning, a good spatial design. Our design consulting service teams works in collaboration with our estimation and construction teams. This way, we can anticipate certain problems before they occur and avoid predictable cost overruns as well as the lengthening of the works. I wanted to renovate my kitchen. So, I contacted an interior designer. She made me plans of my dream kitchen! Then, I made a few requests for quotes from general contractors and the Max Construction approach really impressed me. Their advised me regarding the impact on the value of my home. Renovations according to the plan of my designer could have made my house unsellable and would have caused me a great financial loss. Not to mention the impacts on the regulations form the Régie du Bâtiment du Québec. Frankly a big thank you to Max Larocque Construction, I recommend them to everyone! Take advantage of our turnkey design and renovation service now! Come see us! Our design-consulting services have the resources, the expertise and the will to ensure that the result meets your expectations. Visit our showroom at the same time. Our design services specialize in the design of bathrooms, kitchens, extensions and conversions to create plans that are perfectly up to standard and consistent with your aesthetic expectations. Our design-build services control costs from start to finish according to your budget ensuring a smooth achievement of the project. The execution of the works is ensured by our qualified employees in order to keep control over quality and delays. A complete service for turnkey projects! NEED HELP TO START YOU PROJECT?